When I first discovered molten lava cake, I wondered about it's origin. It seemed to me that this might have been the result of a happy baking accident. So I did a little reading. Lo and behold, I was right! Apparently, once upon a time, a French chef removed a chocolate sponge cake from the oven before it was finished baking. The taste and texture were good, so he went with it! How fun is that? 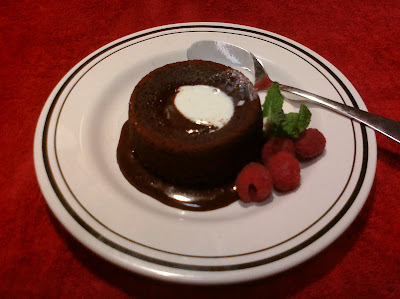 It's also called a fondant pudding, but "lava cake" just sounds so much more decadent to me. Just the thought of warm chocolate 'lava' pouring out of the center of an individual serving sized cake sends me to chocolate heaven! The recipe is deceptively easy to make, and I guarantee you'll impress the hell out of your special someone if you serve this for dessert after a romantic meal! How about adding some candles and fresh berries? Melt chocolate on low flame in double boiler or in microwave. Stir in diced butter, until it melts. In another bowl, beat eggs and sugar, until it starts to whiten. Stir in melted chocolate and then the flour. Butter 4 individual ramekins, and pour in chocolate batter. Tip ramekins upside down onto dessert plates and serve. You can definitely prepare your chocolate lava cake recipe ahead of time, and then bake 10 minutes before serving. In terms of buttering the ramekins: butter the bottoms first, and then butter the sides, wiping from the bottom up to the top. It helps the chocolate to rise even more. In terms of baking time… well, it depends on how runny you want it! I like it with a super-liquid-oozing center. For this, you want the top to be cooked through, but the center to be liquid. You can check with a toothpick after 10 minutes of baking. If you don't like liquid-center chocolate desserts, just cook for a little longer, and you will have an incredibly moist chocolate cake. So, either way, you can't go wrong! You can, if you want, serve your chocolate lava cake recipe with a Crème Anglaise (English Cream) or a Coulis aux Framboises (Raspberry Sauce). Btw, for the Creme Anglaise, which is basically just a vanilla sauce, Ina Garten suggests just buying a pint of your favorite vanilla bean ice cream and let it sit out on the counter until it melts down to almost liquid. And there you have it! The perfect vanilla sauce! And just as Ina always says, "How easy is that?"